There is a nice PBS program on Nature called Animal Homes: The Nest. The program highlights various bird species and how they go about building a nest. It is really worth a watch. The program, however, does not include Peregrine Falcons. 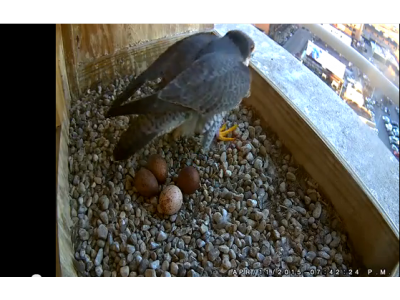 Peregrine falcons do not create a nest by bringing nesting materials to their site. Instead, they create a shallow depression (called a scrape) in the gravel in which they lay their eggs. Both Kewpee and Rebecca made scrapes in the gravel starting in early March. Although Nature missed an opportunity to showcase that in their PBS special, you can watch that activity right here on the website! Check out the video clip in the Video Gallery entitled "Rebecca scrapes gravel with her foot" on March 2, 2015.